This Blueberry Lemon Cheesecake is decadent beyond words. Rich, creamy and perfectly sweet with a thick golden graham cracker crust. Topped with a lush homemade blueberry lemon compote and freshly whipped cream. We are huge fans of cheesecake, a make-ahead dessert that wows guests with looks and flavor. 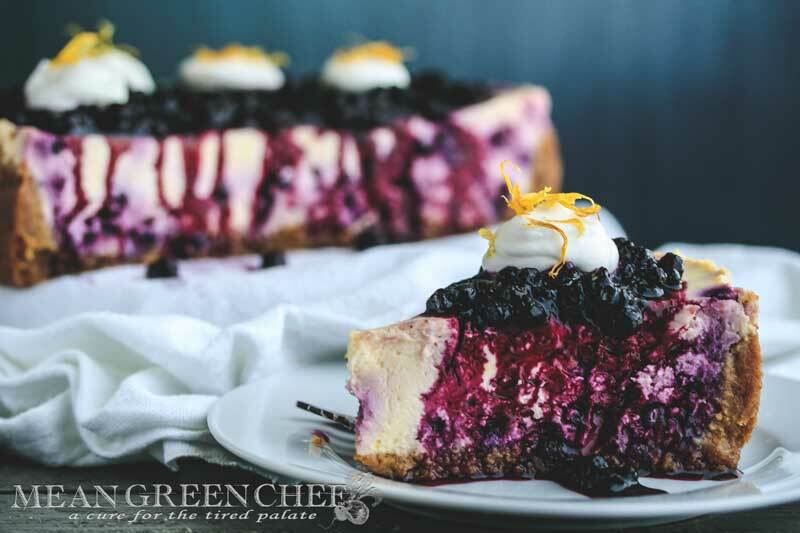 This cheesecake has bright intense flavors of blueberry and a sparkling of lemon that really makes it pop! And while this may be a little time consuming, it certainly worth the effort. Always (always) use room temp cream cheese. When a recipe calls for softened cream cheese, this is what the author is referring to. Softened cream cheese blends better and is creamy when mixed. Cold cream cheese results in a lumpy batter that will reflect in your cake. Allow it to sit out on the counter in its original container for 30-60 minutes. Some cheesecake recipes call for a little flour or cornstarch. This small addition helps keep your cheesecake from cracking and also makes the cake easier to cut into cleaner slices. Also giving the cheesecake an exquisite texture. Why add sour cream to a cheesecake? The addition of sour cream brightens the flavor and cuts the richness of the cheesecake. A fancy name for a water bath that creates a humid environment, allowing the cheesecake to cook gently. This climate aids in creating an irresistibly smooth and creamy cheesecake. That is less prone to cracking and drying out. Cracking typically occurs if a cheesecake is overcooked or cools too quickly. Bake your cheesecake until the outer edge is rather firm but the inner circle 3-4 “ is still jiggly in the very center of the cake. After the time in the oven has elapsed, remove from the oven. Take the cheesecake out of the water bath, and remove the aluminum foil. Set on a rack and cool completely. Bake the crust for 15 minutes, then set aside to cool. 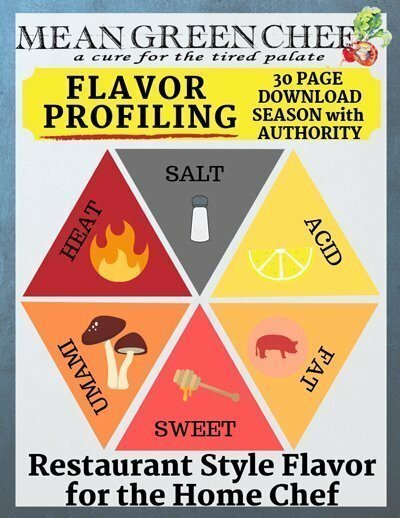 Reduce oven temperature to 300°F/149°C. In a large bowl, beat the room temperature cream cheese, sugar and flour on low speed until well combined and creamy smooth. Be sure to use lower speed to reduce the amount of air added to the batter, which can cause cracks. Add the sour cream, lemon juice, and lemon zest and mix on low speed until well blended. Add the eggs one at a time, mixing slowly to combine after each addition, then add the egg yolks and mix until blended. Scrape down the sides of the bowl as needed to make sure everything is well combined. Place the springform pan inside another larger pan. Fill the outside pan with very hot water about halfway up the sides of the springform pan. Making sure the water does not go over the top of the aluminum foil. Bake for 1 hour 15 minutes. The center should be set, but still jiggly about 3-4” from the center. Turn off the oven and leave the door closed for 30 minutes. The cheesecake will continue to cook, but also slowly cools down. Remove the cheesecake from the oven, and remove the aluminum foil. Set on a rack to finish cooling completely. While the cheesecake cools, make the topping. Combine the blueberries, sugar, lemon zest and juice into a medium-sized saucepan over medium heat and stir to combine. Cook over medium heat, stirring frequently until the sugar begins to melt and the blueberries start to soften and release their juice. Remove from heat when blueberries are a bit juicy and the juice has started to thicken. Pour the mixture into another bowl and cool, refrigerate after cooling. When you’re ready to serve the cheesecake remove from the fridge, slice (see notes above) and then allow it to sit at room temp for 30-60 minutes. *Frozen blueberries will bleed into your batter slightly, we have used both fresh and frozen when making this cake. The cheesecake above was made with frozen. Add the heavy whipping cream, to a well-chilled bowl and beat until soft peaks begin to form. Add the powdered sugar and real vanilla extract and beat on high speed just until stiff peaks form. If you overbeat your whipped cream and have a butter-like consistency, just add a tablespoon or two of whipping cream and beat on low until desired texture is reached. Be sure and check out our Pumpkin Spice Cheesecake with Caramel Sauce for an awesome seasonal dessert! And if you have some leftover blueberries, try making our ultra-tasty Blueberry Lemon Quick Bread.